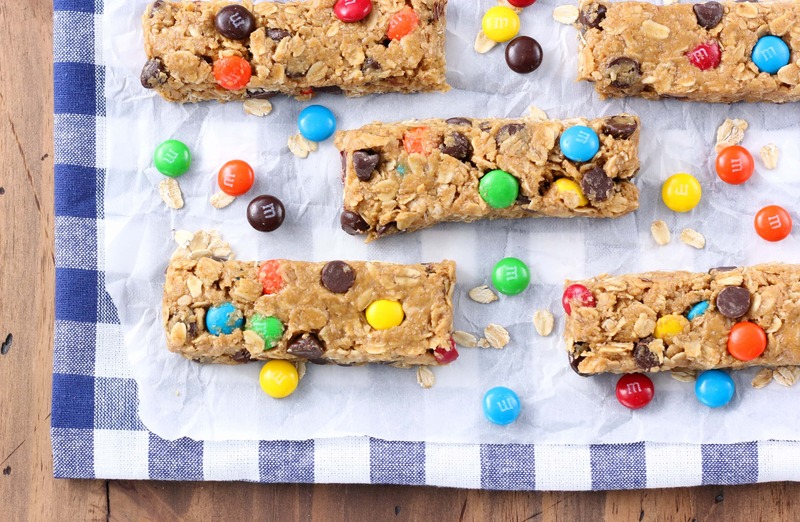 All of the makings of healthier monster cookies are found in these No Bake Monster Cookie Granola Bars! You just need one bowl, one spoon, and less than 10 minutes of preparation! *Recipe and text from 10/31/12. Images updated 03/08/17. I just realized that this is my third peanut butter recipe in one week! I guess it shouldn’t come as a surprise to you. It is pretty apparent that the kitchen at A Kitchen Addiction is frequently putting out recipes involving peanut butter! If you are ever wondering what we may be eating at any given time, you would have a good chance at being correct by guessing something with peanut butter! It’s a staple, and because of that, one should never go too long without it! 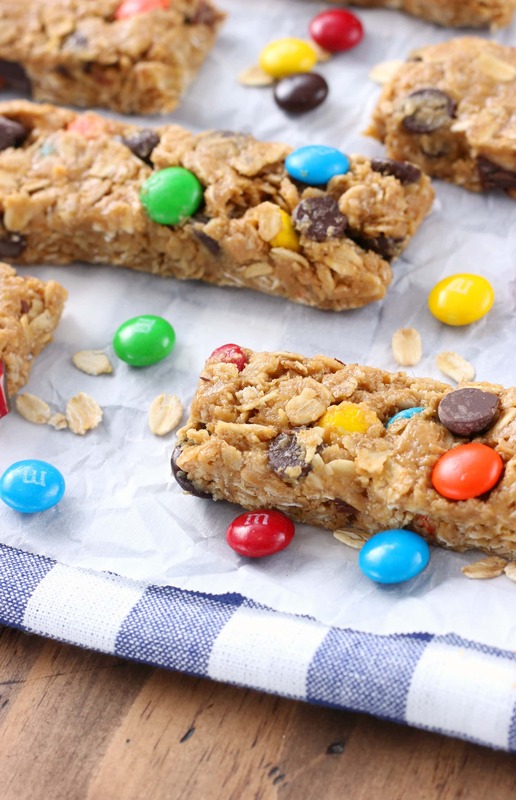 These monster cookie granola bars are a revision to these peanut butter dark chocolate chip no bake granola bites. Yes, another peanut butter recipe. Just like in that recipe, you can use either creamy or crunchy peanut butter in this recipe. Since I prefer creamy and my husband prefers crunchy, we can both be happy because either one works great. Plus, it’s an easy enough recipe that it doesn’t take much time to make a batch of each! All of the makings of semi-healthy monster cookies can be found in these. . .oats, peanut butter, chocolate chips and M&M’s for the monster cookie and flaxseed, oat bran, and honey for the nutrition. 😉 I used regular milk chocolate M&M’s for the granola bars, but you could use whatever variety you have on hand. These granola bars require one bowl, one spoon, and less than 10 minutes of preparation. You can’t ask for a quicker recipe to throw together for a snack for the kids or for you with your busy on-the-go schedule! Spray an 8×8 baking dish with non-stick cooking spray. In a medium bowl, stir together oats, flaxseed, oat bran, and salt. Stir in peanut butter, honey, and vanilla extract until well-combined using a wooden spoon. Add in chocolate chips and M&M’s. Stir to combine. Firmly press dough into baking dish. Refrigerate for 30 minutes to allow dough to stiffen. Cut into 9 bars. Store leftovers in the refrigerator. Can you ever have enough peanut butter????? The answer is no of course! 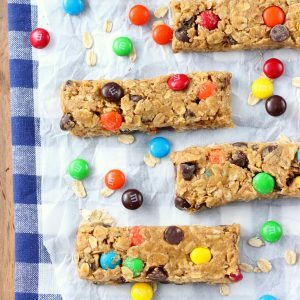 I love the idea of monster granola bars! This is an excellent snack for me, er I mean my kids! Yum!! Love that it is a no bake!! Happy Halloween! Hope you and your family have a spook-tacular day! 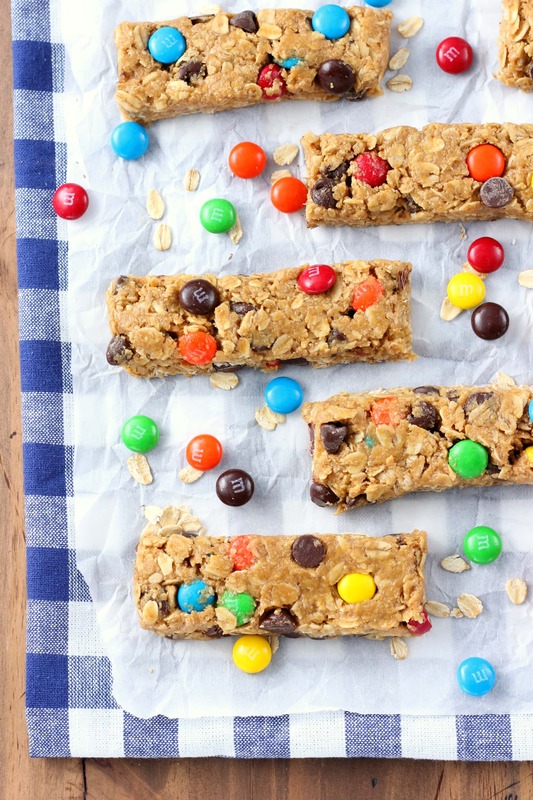 I definitely want these peanut butter granola bars in my kitchen. And they’re monster cookie flavored! Be still my heart. These look amazing and no bake. Loving the PB and pretzel M&M’s? Why oh why don’t we have those puppies here? I can never have enough peanut butter…so keep them coming!!! 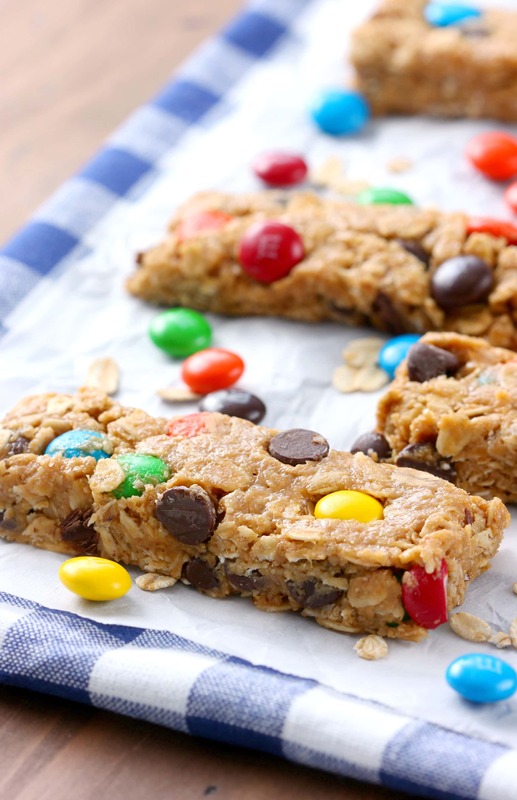 Monster cookies are the best…I love that you recreated them in granola bars with pretzel MM’s. These are awesome!!! These look awesome!!! And love any excuse to buy some pretzel M&Ms! Yummm! Anything that requires less time to be yummy is ok by me! I love monster cookies! What a great idea to put them into a bar! I’m afraid that I’m slightly addicted to the monster cookie combination. . .I look for any way to incorporate it into snacks and desserts! These look delicious! I love the pretzel M&M idea. I am going to have my husband whip me up a batch. Who is your wonderful photographer? The colors are so intense and inviting! You two make a wonderful combo! flaxseed! Interesting…my husband is very keen on flaxseed.I will have to make a note to sneak it into baked goods. These are too good! I love monster cookies but I wouldn’t feel so bad about eating these! You can NEVER have too much peanut butter; especially when it’s partnered with all those healthy ingredients! No such thing as too much peanut butter! I love how these are part dessert part healthy snack. The best of both worlds. These look great-I just printed this so I could try making them for the kids! Thanks Bree! I hope they like them! These are a good way to use up leftover Halloween candy, too. Yum! Thanks…I’m always looking for homemade treats to put in my kids’ lunches…I’ll just have to substitute the PB. Maybe Biscoff? Oh, biscoff is a great idea! What a fantastic, healthy, delicious cookie! They look awesome! these look so good. i must make them soon!!! Yum!! I have all of these ingredients in my kitchen right this very second… dangerous! Especially since they sound so easy to make too. These are great granola bars, I would love them as a snack or breakfast too. I love this recipe! No-bake is awesome, and peanut butter. Well. Peanut butter is the best thing ever! Thanks Dorothy! We eat quite a bit of it around here! You can keep posting PB recipes, I love them! I could eat these every day. They look so yummy. I love this no-bake giant cookie! Yum! I’d love to have this around the house for snacking 🙂 Just signed up to get your posts via email because apparently I’m terrible at keeping up via reader! They do make great snacks! 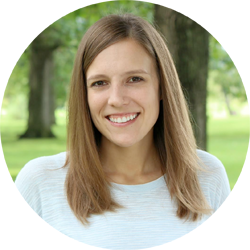 Thanks for signing up, Abby! Man, these sound so good! I made Monster Cookies earlier this week, but I love your version; I wouldn’t feel as guilty eating them! Keep the peanut butter recipes coming! I love that this is no bake – I could seriously make and eat this all day! I bought a box of these from Target and just love…even better to make my own now! Oh these look out of control yummy, girl! I love that they’re no bake. Can’t wait to make them for my nieces! Thanks Caroline! I hope you like them! Is the ground flax needed? Is there something else we could replace it with? You will need something to replace it in order to absorb the moisture and help the bars set. You could replace it with more oat bran. Hope that helps!